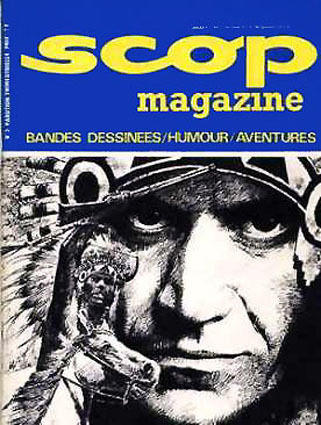 In Paris Luis arranged to show his work to the editor of Pilote magazine; Rene Goscinny, best known for writing the legendary French strip Asterix The Gaul. 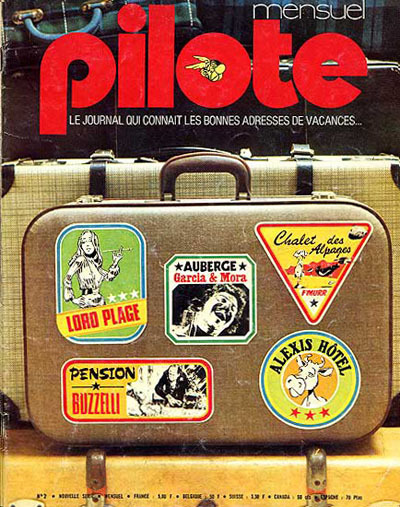 Pilote enjoyed massive success in the '60s due to the popularity of strips such as Asterix, Lucky Luke and Lieutennant Blueberry but by the early '70s the magazines tone had changed distinctly. 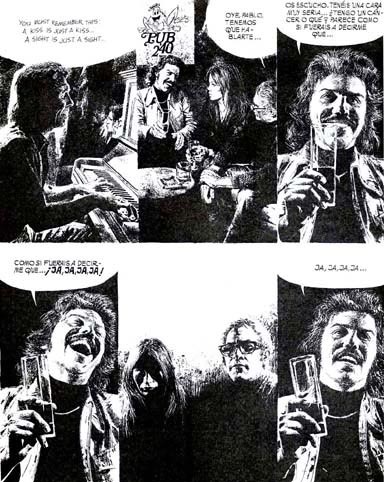 It became (along with Italy’s Linus) one of the forerunners of the adult comics phenomena that would later include Metal Hurlant and its American counterpart Heavy Metal. 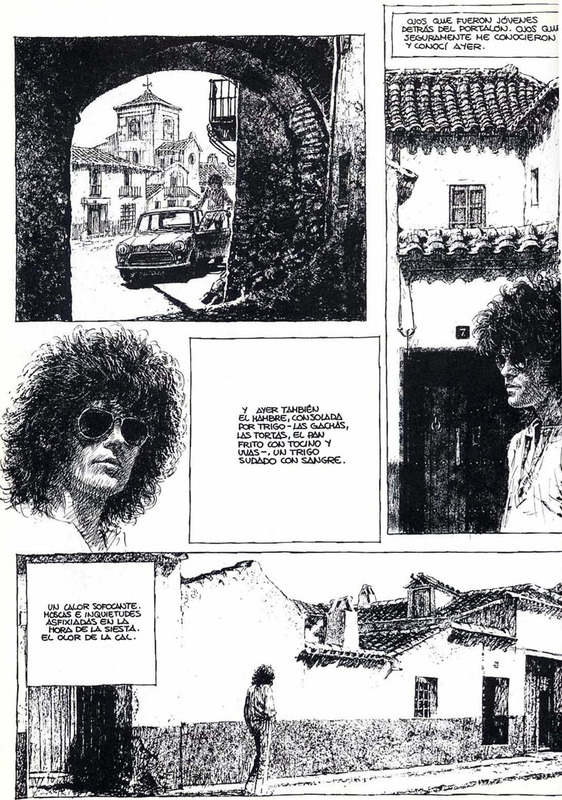 The resulting series was called "Les Chronicles Des Sin Nombres" and it was a series of unconnected strips each telling a story from a different period, from medieval times to the wild west and from the war to contemporary Spain. Pilote offered Luis complete artistic freedom and it was here that he finally established his own, fully realised artistic personality. 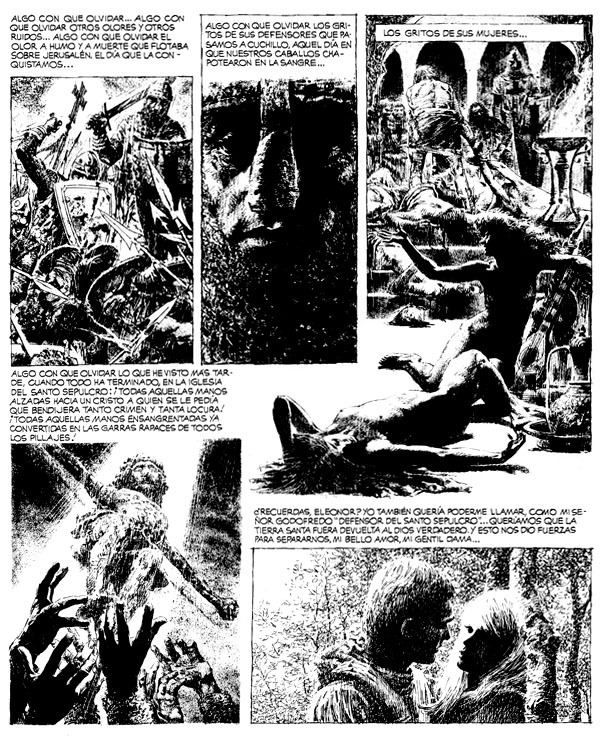 The strips built on the realistic, textured approached of his Warren work, but revealed an increased assurance in both storytelling and draughtsmanship. In my opinion they are amongst the most beautiful comic book pages ever drawn and closer inspection of the original art from the series reveals an astonishing delicacy and assurance. The originals were drawn quite large (around a half imperial) and rendered with extremely delicate, fine ink lines. The linework is never so tight however that the whole thing closes up into lifelessness, they retain a lively, vigorous quality. In fact in some cases the linework is held together and given weight by the almost tactile tone which is layered on top of it. The tone would have been a combination of sponged –on ink and finer areas dabbed on with a thumb or finger. Other, diffuse lines were achieved by putting down a pen line and then quickly smudging it across the page with a thumb. These textured drawings were then finessed and distressed by scratches and cuts from a scalpel blade. In fact a closer look at some of the panels reveal figures that appear to be nothing more than a mass of smears, daubs and scratches which somehow coalesce into a thrillingly substantial whole. The pages manage the almost impossible achievement of being at once astonishing bold and at the same time breath-takingly delicate. 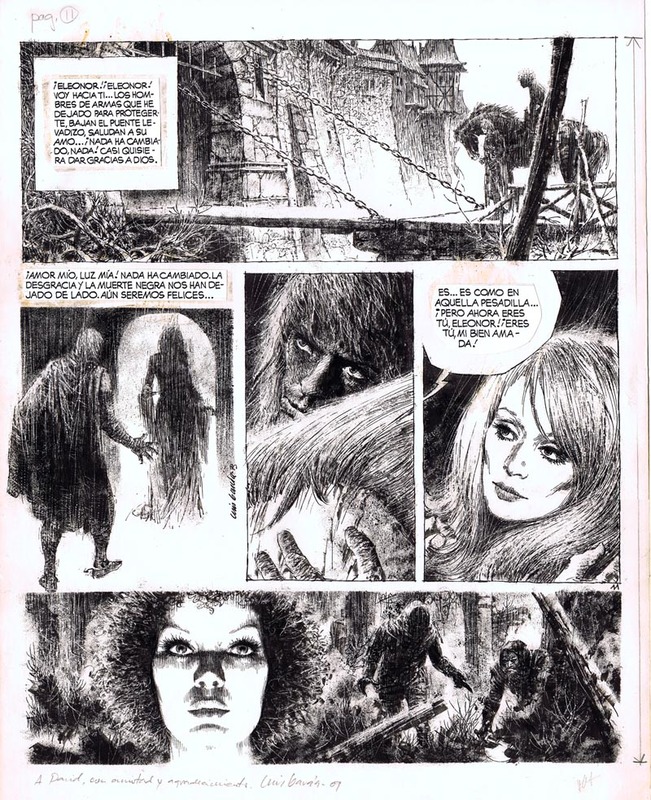 The first 5 Pilote strips were soon re-sold to Warren and were printed in Vampirella allowing American fans to see how Luis had matured and only a few years later again “The Wolves that War at War's End” was reprinted in Heavy Metal. 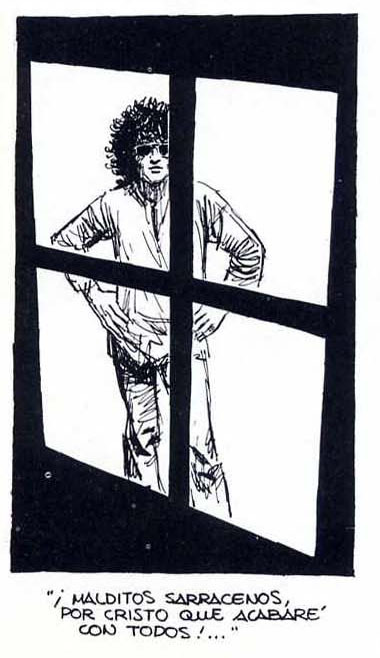 Life on the commune freed Luis from the usual economic imperitives that govern the work of most artists and allowed him the chance to retreat from the demands of constant comic strip work for the first time in over a decade. Following a trip back to his childhood home of Puertollano he was so overwhelmed by the experience that he felt compelled to put it down on paper, which he did with the help of a script from Felipe Hernandez Cava. The resulting strip called "Chicharras" was a poignant meditation on nostalgia in which we follow Luis as he walks around the village revisiting the key moments of his childhood. 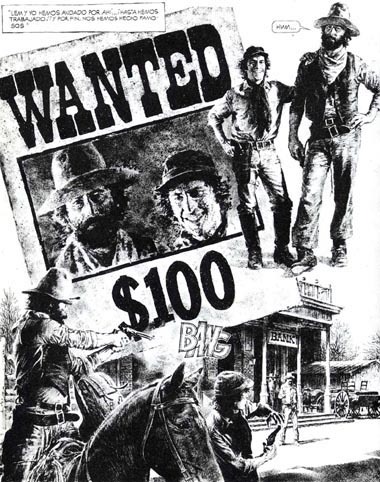 Visually there is a continuity with the ultra-realist approach of his Pilote work though with a looser, sketchier line and a masterful use of white space - you can almost feel the heat and dust. 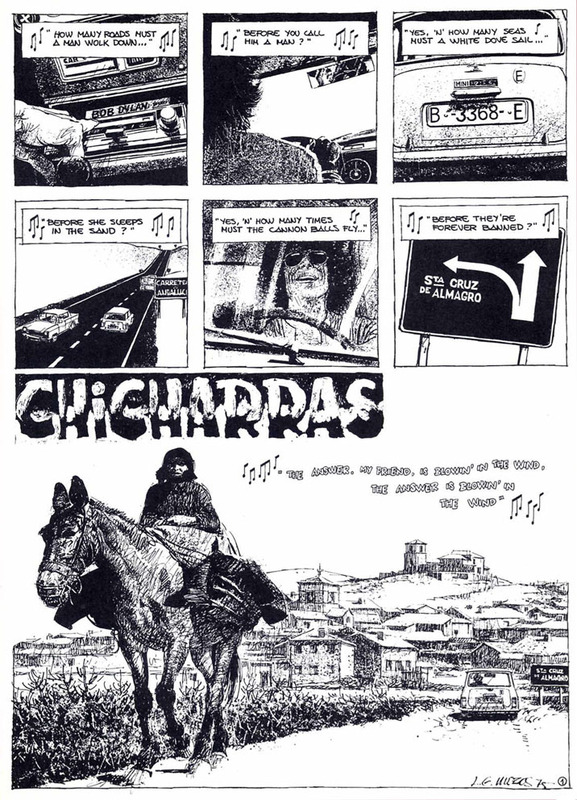 Beyond its sensual appeal however Chicharras was significant in another way; it was the first time as far I’m aware anywhere in the world that a mainstream artist had created a wholly autobiographical comic strip. In this Luis had more in common with the likes of Underground artists such as Justin Green and Robert Crumb but their work at the time was still laced with humour and flights of wild imagination whereas Chicharras was a far more mature, reflective piece. 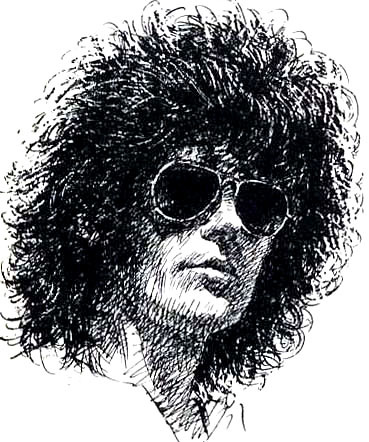 Having drawn it he eventually found a place for it in the French magazine Scop and the Spanish title Bang and this would set the pattern for much of the rest of his career. In what now looks like a revolutionary move, from this point on Luis would create almost all of his work for himself and then find a market for a later. 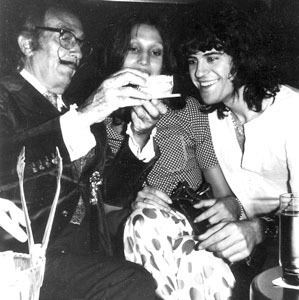 It was the throwing off of the shackles of commercial art and his emergence as a serious artist. most enlightening and enjoyable. Having watched the progression of "Luis Garcia" through the Warren and Pilotes, there was always the nagging question of "were they the same artist?" Now I know. I have never heard of this artist before. 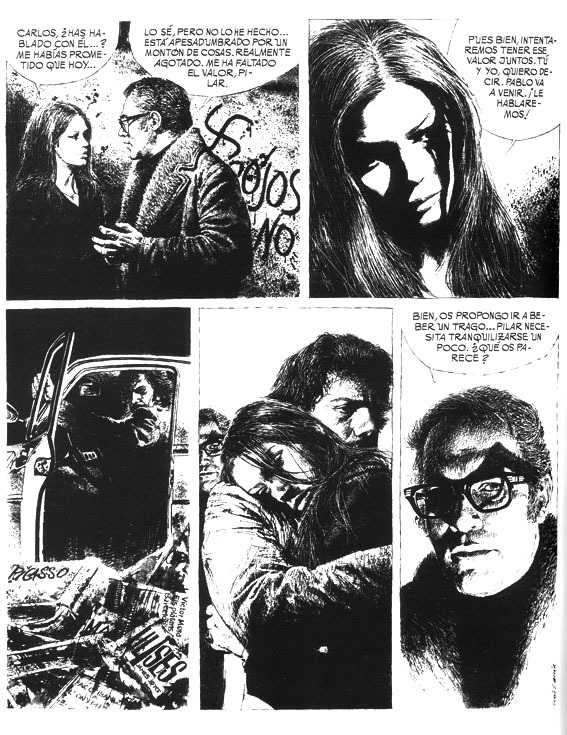 The art is so gripping - I hope that I can find some of his work in English or German.